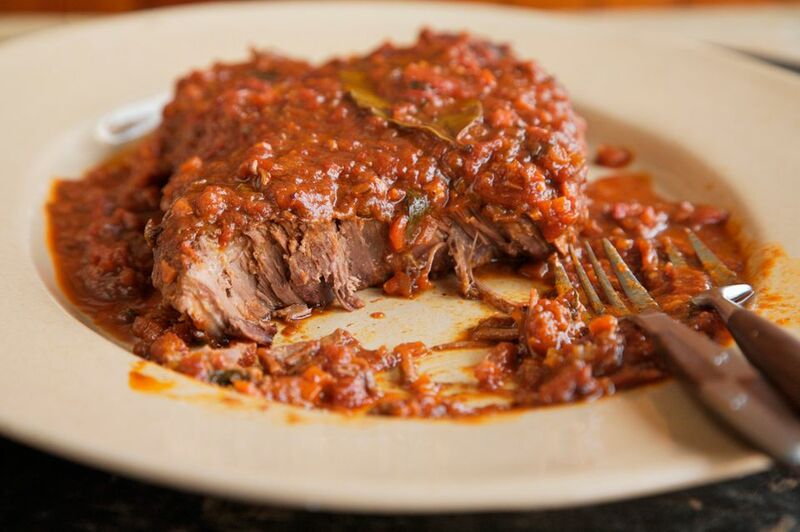 Swiss steak is actually not from Switzerland, but instead is so named because of the tenderizing technique used called “swissing,” which means rolling or pounding. Once prepared this way, it is braised along with tomatoes as well as other seasonings and ingredients. This recipe for swiss steak is a classic combination that is cooked to perfection in the crock pot. The slow cooked steaks are full of flavor, with tomatoes, herbs, and vegetables, and a little beef broth and Worcestershire sauce. If you don’t want to pound (or swiss) the steak yourself, make sure to buy thinned round steak or chuck, or you can use a sliced lean chuck roast. Sometimes confused with Salisbury steak, Swiss steak is a completely different dish. While Swiss steak is pieces of steak in a tomato sauce, Salisbury steak is actually similar to a hamburger, as it is made of ground beef shaped into a patty and covered with a brown gravy. Swiss steak is cooked in an oven or slow cooker, while Salisbury steak is prepared on the stovetop or under the broiler. Just something to keep in mind when you try to order this delicious dish from a restaurant. Combine flour, thyme, paprika, salt, and pepper in a small, shallow bowl, or pie plate. Brush the beef pieces with Worcestershire sauce. Then dredge in the flour mixture. Heat a large heavy skillet over medium-high heat. Add the oil to the hot skillet, and then the coated steak pieces; sear for about 5 minutes on each side. Transfer steak to the slow cooker. Sprinkle the minced garlic and sliced celery over the steaks, then top it with the sliced onion and tomatoes. Pour beef stock into the hot skillet and use a spatula to loosen any brown bits. Let cook for a minute or two. Then pour over steak in the slow cooker, cover, and cook on LOW for 7 to 9 hours or on HIGH for about 4 to 5 hours. Serve with mashed potatoes, noodles, or rice, alongside a tossed salad, green beans, or your family's favorite side vegetables. To create an even richer flavor, add a few tablespoons of red wine along with the beef broth when you're deglazing the skillet. If this recipe is a big hit in your house, why not try it with a few variations? It is delicious with mushrooms or made with a with a creamy sauce.